I reached an important milestone as a prot paladin about a week ago when I reached the uncrushable cap which is a different cap from the defense cap. Paladins can't maintank bosses in raids until they reach the uncrushable cap, until then they are paper tanks for raid bosses. You can offtank non-bosses in raids before reaching that cap though. 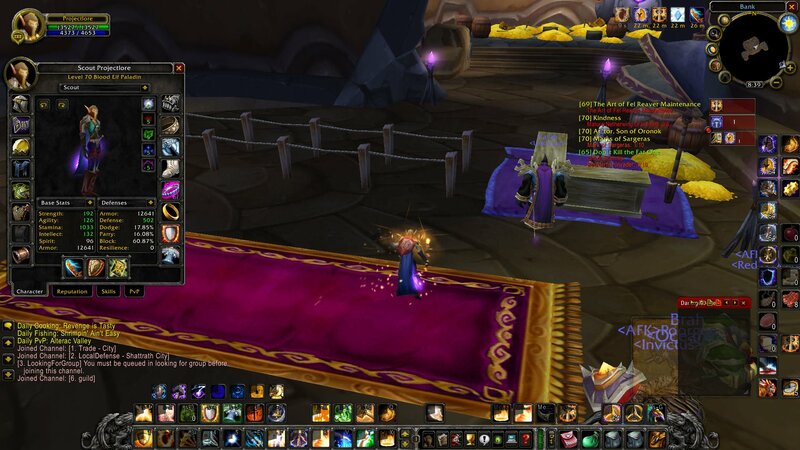 I was therefore very excited to have no problems tanking Netherspite yesterday. So how do we calculate if we are uncrushable or how much is still missing? The uncrushable cap is 102.4% avoidance or more with holy shield up. So we calculate our avoidance which is block + dodge + parry + the chance to be missed (found at the bottom of the defense tooltip in your character screen) + the basic chance to be missed which is 5%. So the formula in my case as shown on the picture is 60.87% block + 16.08% parry + 17.85% dodge + 6.08% + 5% = 105,88% avoidance. 2 items that i really recommend for reaching this cap is the trinket Figurine of the colossus from Shattered Halls and the badge libram, Libram of Repentance. You should also know the difference between shield block rating and block value. Shield block rating provides important block % while block value only provides increased damage blocked on blocks. Another thing I could mention is that Agility on items provides dodge even though the tooltip doesn´t say so. You can confirm that by equipping any item with agility on it.